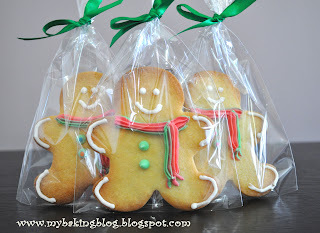 My Baking Blog: Merry Christmas and Happy Holidays! Merry Christmas to all of you!! I hope you had a very good time partying and feasting on Christmas goodies! I have not been in hiatus the past month. I was just very busy baking! This is the first time I tried accepting orders for some of my bakes, so it was a little overwhelming for me. Unfortunately, my joints got swollen about a week before Christmas (not due to overbaking, but a viral infection), so I baked less than I would love to. Christmas does not seem quite complete without some decorated cookies. So, this year, just like the previous years, I made some cookies. Believe it or not, I never made gingerbread man shaped cookies the past years. The past years, I made them in star and christmas tree shapes. This year, I bought a set of Wilton gingerbread man cookie cutters and had them in various sizes and this is how they look like. Those on sticks were for the children. I made some snowflake ones and decorated them with fondant and royal icing and added some names behind to personalise them and boy, was that time consuming! 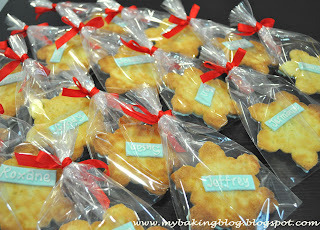 To make these decorated cookies, you can use any shortbread cookie recipe (I like the one from Joy of Baking). They are very delicious, however, they can be too delicate and crumble easily, especially during transporting. Therefore, most of the time, if I were to decorate them, I would make these for my own consumption only. 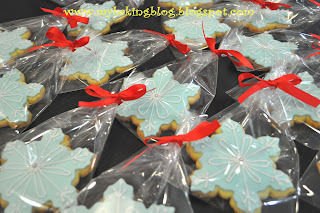 Sugar cookies are also perfect for decoration and does not crumble as easily as shortbread. They hold up pretty well and when baked, retain their shapes and will not puff up much. I have a recipe which I tweaked myself and it is here. I was also supposed to make log cakes for 2 of my friends. Due to the doctor's advice to rest and avoid overexerting my hands in the meantime, I could not make them. The christmas themed boxes and cake decorations figurines are all kept unused. Guess I have to keep them for a year! I am rather disappointed, because I myself would love to eat a slice of the cake, but well perhaps things all happen for a reason. 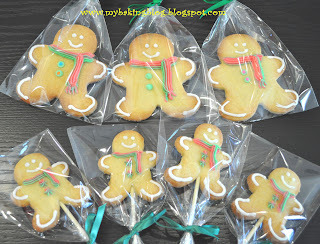 How cute the ginger men!! Looks yummy!